For other uses, see Buffalo Bill (disambiguation) and Buffalo Bills (disambiguation). "Bill Cody" redirects here. For other uses, see Bill Cody (disambiguation). Le Claire, Iowa Territory, U.S.
William Frederick "Buffalo Bill" Cody (February 26, 1846 – January 10, 1917) was an American scout, bison hunter, and showman. He was born in Le Claire, Iowa Territory (now the U.S. state of Iowa), but he lived for several years in his father's hometown in Toronto Township, Ontario, Canada, before the family returned to the Midwest and settled in the Kansas Territory. Buffalo Bill started working at the age of eleven, after his father's death, and became a rider for the Pony Express at age 15. During the American Civil War, he served the Union from 1863 to the end of the war in 1865. Later he served as a civilian scout for the US Army during the Indian Wars, receiving the Medal of Honor in 1872. Cody was born on February 26, 1846, on a farm just outside Le Claire, Iowa. His father, Isaac Cody, was born on September 5, 1811, in Toronto Township, Upper Canada, now part of Mississauga, Ontario, directly west of Toronto. Mary Ann Bonsell Laycock, Bill's mother, was born about 1817 in New Jersey, near Philadelphia. She moved to Cincinnati to teach school, and there she met and married Isaac. She was a descendant of Josiah Bunting, a Quaker who had settled in Pennsylvania. There is no evidence to indicate Buffalo Bill was raised as a Quaker. In 1847 the couple moved to Ontario, having their son baptized in 1847, as William Cody, at the Dixie Union Chapel in Peel County (present-day Peel Region, of which Mississauga is part), not far from the farm of his father's family. The chapel was built with Cody money, and the land was donated by Philip Cody of Toronto Township. They lived in Ontario for several years. In 1853, Isaac Cody sold his land in rural Scott County, Iowa, for $2000, and the family moved to Fort Leavenworth, Kansas Territory. In the years before the Civil War, Kansas was overtaken by political and physical conflict over the slavery question. Isaac Cody was against slavery. He was invited to speak at Rively's store, a local trading post where pro-slavery men often held meetings. His antislavery speech so angered the crowd that they threatened to kill him if he didn't step down. A man jumped up and stabbed him twice with a Bowie knife. Rively, the store's owner, rushed Cody to get treatment, but he never fully recovered from his injuries. In Kansas, the family was frequently persecuted by pro-slavery supporters. Cody's father spent time away from home for his safety. His enemies learned of a planned visit to his family and plotted to kill him on the way. Bill, despite his youth and being ill at the time, rode 30 miles (48 km) to warn his father. Isaac Cody went to Cleveland, Ohio, to organize a group of thirty families to bring back to Kansas, in order to add to the antislavery population. During his return trip he caught a respiratory infection which, compounded by the lingering effects of his stabbing and complications from kidney disease, led to his death in April 1857. After his death, the family suffered financially. At age 11, Bill took a job with a freight carrier as a "boy extra". On horseback he would ride up and down the length of a wagon train and deliver messages between the drivers and workmen. Next he joined Johnston's Army as an unofficial member of the scouts assigned to guide the United States Army to Utah, to put down a rumored rebellion by the Mormon population of Salt Lake City. Presently the moon rose, dead ahead of me; and painted boldly across its face was the figure of an Indian. He wore this war-bonnet of the Sioux, at his shoulder was a rifle pointed at someone in the river-bottom 30 feet [9 meters] below; in another second he would drop one of my friends. I raised my old muzzle-loader and fired. The figure collapsed, tumbled down the bank and landed with a splash in the water. 'What is it?' called McCarthy, as he hurried back. 'It's over there in the water.' 'Hi!' he cried. 'Little Billy's killed an Indian all by himself!' So began my career as an Indian fighter. At the age of 14, in 1860, Cody was struck by gold fever, with news of gold at Fort Colville and the Holcomb Valley Gold Rush in California, On his way to the gold fields, however, he met an agent for the Pony Express. He signed with them, and after building several stations and corrals, Cody was given a job as a rider. He worked at this until he was called home to his sick mother's bedside. Cody claimed to have had many jobs, including trapper, bullwhacker, "Fifty-Niner" in Colorado, Pony Express rider in 1860, wagonmaster, stagecoach driver, and a hotel manager, but historians have had difficulty documenting them. He may have fabricated some for publicity. Namely, it is argued that in contrast to Cody's claims, he never rode for the Pony Express, but as a boy, he did work for its parent company, the transport firm of Russell, Majors, and Waddell. In contrast to the adventurous rides, hundreds of miles long, that he recounted in the press, his real job was to carry messages on horseback from the firm's office in Leavenworth to the telegraph station three miles away. After his mother recovered, Cody wanted to enlist as a soldier in the Union Army during the American Civil War but was refused because of his young age. He began working with a freight caravan that delivered supplies to Fort Laramie in present-day Wyoming. 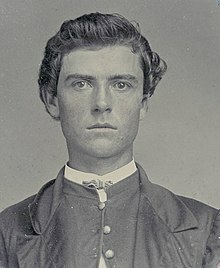 In 1863, at age 17, he enlisted as a teamster with the rank of private in Company H, 7th Kansas Cavalry, and served until discharged in 1865. The next year, Cody married Louisa Frederici. They had four children. Two died young, while the family was living in Rochester, New York. They and a third child are buried in Mount Hope Cemetery, in Rochester. In 1866, he reunited with his old friend Wild Bill Hickok in Junction City, Kansas, then serving as a scout. Cody enlisted as a scout himself at Fort Elsworth and scouted between there and Fort Fletcher (later renamed and moved to Fort Hays). He was attached as a scout, variously, to Captain George Augustus Armes (Battle of the Saline River) and Lieutenant Colonel George Armstrong Custer (guide and impromptu horse race to Fort Larned). It was during this service at Fort Elsworth that he met William Rose, with whom he would found the short-lived settlement of Rome, Kansas. In 1867, with construction of the Kansas Pacific Railway completing through Hays City and Rome, Cody was granted leave of absence to hunt buffalo to supply railroad construction workers with meat. 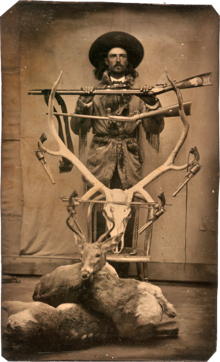 This endeavor continued into 1868, which saw his hunting contest with William Comstock. Cody returned to Army service in 1868. From his post in Fort Larned, he performed an exceptional feat of riding as a lone dispatch courier from Fort Larned to Fort Zarah (escaping capture), Fort Zarah to Fort Hays, Fort Hays to Fort Dodge, Fort Dodge to Fort Larned, and, finally, Fort Larned to Fort Hays, a total of 350 miles in 58 hours through hostile territory, covering the last 35 miles on foot. In response, General Philip Sheridan assigned him Chief of Scouts for the 5th Cavalry Regiment. He was also Chief of Scouts for the Third Cavalry in later campaigns of the Plains Wars. In January 1872, Cody was a scout for the highly publicized hunting expedition of the Grand Duke Alexei Alexandrovich of Russia. Cody was awarded the Medal of Honor in 1872 for gallantry as an Army scout in the Indian Wars. It was revoked in 1917, along with medals of 910 other recipients, when Congress authorized the War Department to revoke prior Army Medal of Honor awards it had considered dubious since the introduction of strict regulations in 1897. All civilian medals were revoked, including civilian scouts, since they did not meet the basic criterion of being officers or enlisted soldiers, which had been expressly listed in every authorizing statute ever enacted. Cody was one of five scouts affected. Their medals were stripped shortly after Cody died in 1917. Cody's relatives objected, and over a number of years they wrote repeatedly to Congress seeking reconsideration. All efforts failed, including a 1988 letter to the US Senate from Cody's grandson, until the office of Senator Alan K. Simpson of Wyoming took up the cause in 1989. Its brief, which argued for the retroactive elevation of these civilian scouts' status to meet the Medal's standards, persuaded the Army Board for Correction of Military Records to restore their medals. The decision was controversial for a number of reasons. Senator Simpson's submission argued that the law had never required Cody to be a soldier, which was untrue, as every version of the law had required this. Simpson's submission cited a book, Above and Beyond, to illustrate this point, but the source actually listed the correct law that required Cody to be an enlisted soldier. Another problem was the questionable authority of the Board for Correction to contravene several federal statutes; the Medal of Honor revocation had been expressly authorized by Congress, meaning that the restoration went against the law in force in 1872, the law requiring the revocation in 1916, and the modern statute enacted in 1918 that remains substantially unmodified today. Since the Board of Correction is merely a delegation of the Secretary of the Army's authority, this raises a separation of powers conflict, since even the president cannot contravene a clear statute, yet Cody's medal was dealt with below the cabinet level. Modern Medal of Honor cases originating from the board, such as the recent case of Garlin Conner, required both executive action as well as a statutory waiver from Congress, which underscores this point. In the Cody case, the board's governing assistant secretary recognized that it lacked the authority to reinstate the medal directly, and so decided to return the case to the board for reconsideration. As a result, the board amended Cody's record to make him an enlisted soldier so that he would fall within the legal requirements, and did the same for four other civilian guides who had also had their medals rescinded. In doing so, the board overlooked the fact that Cody was a civilian guide with far greater employment flexibility than a soldier, including the ability to resign at will. In 1869, the twenty-three year-old Cody met Ned Buntline, who later published a story based on Cody's adventures (largely invented by the writer) in Street and Smith's New York Weekly and then published a highly successful novel, Buffalo Bill, King of the Bordermen, which was first serialized on the front page of the Chicago Tribune, beginning that December 15. Many other sequels followed by Buntline, Prentiss Ingraham and others from the 1870s through the early part of the twentieth century. 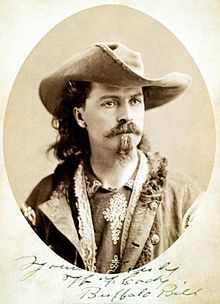 Cody later became world-famous for Buffalo Bill's Wild West, a touring show which traveled around the United States, Great Britain, and Continental Europe. Audiences were enthusiastic about seeing a piece of the American West. 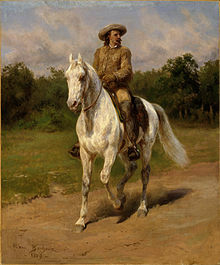 Emilio Salgari, a noted Italian writer of adventure stories, met Buffalo Bill when he came to Italy and saw his show; Salgari later featured Cody as a hero in some of his novels. Buffalo Bill's Wild West, 1890, Italy. In December 1872, Cody traveled to Chicago to make his stage debut with his friend Texas Jack Omohundro in The Scouts of the Prairie, one of the original Wild West shows produced by Ned Buntline. The effort was panned by critics - one critic compared Cody's acting to a "diffident schoolboy" - but the handsome performer was a hit with the sold-out crowds. 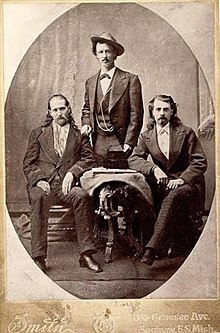 In 1873, Cody invited "Wild Bill" Hickok to join the group in a new play called Scouts of the Plains. Hickok did not enjoy acting and often hid behind scenery; in one show, he shot at the spotlight when it focused on him. As such, he was released from the group after a few months. Cody founded the Buffalo Bill Combination in 1874, in which he performed for part of the year, while scouting on the prairies the rest of the year. The troupe toured for ten years. Cody's part typically included a reenactment of an 1876 incident at Warbonnet Creek, where he claimed to have scalped a Cheyenne warrior. In 1883, in the area of North Platte, Nebraska, Cody founded Buffalo Bill's Wild West, a circus-like attraction that toured annually. (Contrary to the popular misconception, the word show was not a part of the title.) With his show, Cody traveled throughout the United States and Europe and made many contacts. He stayed, for instance, in Garden City, Kansas, in the presidential suite of the former Windsor Hotel. He was befriended by the mayor and state representative, a frontier scout, rancher, and hunter named Charles "Buffalo" Jones. In 1886, Cody and Nate Salbsury, his theatrical manager, entered into partnership with Evelyn Booth (1860–1901), a big-game hunter and scion of the aristocratic Booth family. It was at this time Buffalo Bill's Cowboy Band was organized. The band was directed by William Sweeney, a cornet player who served as leader of the Cowboy Band from 1883 until 1913. Sweeney handled all of the musical arrangements and wrote a majority of the music performed by the Cowboy Band. In 1893, Cody changed the title to Buffalo Bill's Wild West and Congress of Rough Riders of the World. The show began with a parade on horseback, with participants from horse-culture groups that included US and other military, cowboys, American Indians, and performers from all over the world in their best attire. Turks, gauchos, Arabs, Mongols and Georgians displayed their distinctive horses and colorful costumes. Visitors would see main events, feats of skill, staged races, and sideshows. Many historical western figures participated in the show. For example, Sitting Bull appeared with a band of 20 of his braves. Cody's headline performers were well known in their own right. Annie Oakley and her husband, Frank Butler, were sharpshooters, together with the likes of Gabriel Dumont and Lillian Smith. Performers re-enacted the riding of the Pony Express, Indian attacks on wagon trains, and stagecoach robberies. The show was said to end with a re-enactment of Custer's Last Stand, in which Cody portrayed General Custer, but this is more legend than fact. The finale was typically a portrayal of an Indian attack on a settler's cabin. Cody would ride in with an entourage of cowboys to defend a settler and his family. This finale was featured predominantly as early as 1886 but was not performed after 1907; it was used in 23 of 33 tours. Another celebrity appearing on the show was Calamity Jane, as a storyteller as of 1893. The show influenced many 20th-century portrayals of the West in cinema and literature. With his profits, Cody purchased a 4,000-acre (16-km²) ranch near North Platte, Nebraska, in 1886. The Scout's Rest Ranch included an eighteen-room mansion and a large barn for winter storage of the show's livestock. In 1887, Cody took the show to Great Britain in celebration of the Jubilee year of Queen Victoria, who attended a performance. It played in London and then in Birmingham and Salford, near Manchester, where it stayed for five months. In 1889, the show toured Europe, and in 1890 Cody met Pope Leo XIII. On March 8, 1890, a competition took place. Buffalo Bill had met some Italian butteri (a less-well-known sort of Italian equivalent of cowboys) and said his men were more skilled at roping calves and performing other similar actions. A group of Buffalo Bill's men challenged nine butteri, led by Augusto Imperiali, at Prati di Castello neighbourhood in Rome. The butteri easily won the competition. Augusto Imperiali became a local hero after the event: a street and a monument were dedicated to him in his hometown, (Cisterna di Latina), and he was featured as the hero in a series of comic strips in the 1920s and 1930s. Cody set up an independent exhibition near the Chicago World's Fair of 1893, which greatly contributed to his popularity in the United States. It vexed the promoters of the fair, who had rejected his request to participate..
On October 29, 1901, outside Lexington, North Carolina, a freight train crashed into one unit of the train carrying Buffalo Bill's show from Charlotte, North Carolina, to Danville, Virginia. The freight train's engineer had thought that the entire show train had passed, not realizing it was three units, and returned to the tracks; 110 horses were killed in the crash or had to be killed later, including his personal mounts Old Pap and Old Eagle. No people were killed, but Annie Oakley's injuries were so severe that she was told she would never walk again. She did recover and continued performing later. The incident put the show out of business for a while, and this disruption may have led to its eventual demise. In 1908, Pawnee Bill and Buffalo Bill joined forces and created the Two Bills show. That show was foreclosed on when it was playing in Denver, Colorado. 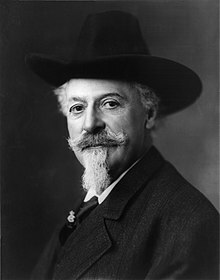 Buffalo Bill's Wild West toured Europe eight times, the first four tours between 1887 and 1892, and the last four from 1902 to 1906. The Wild West first went to London in 1887 as part of the American Exhibition, which coincided with the Golden Jubilee of Queen Victoria. The Prince of Wales, later King Edward VII, requested a private preview of the Wild West performance; he was impressed enough to arrange a command performance for Queen Victoria. The Queen enjoyed the show and meeting the performers, setting the stage for another command performance on June 20, 1887, for her Jubilee guests. Royalty from all over Europe attended, including the future Kaiser Wilhelm II and the future King George V. These royal encounters provided Buffalo Bill's Wild West an endorsement and publicity that ensured its success. Buffalo Bill's Wild West closed its successful London run in October 1887 after more than 300 performances, with more than 2.5 million tickets sold. The tour made stops in Birmingham and Manchester before returning to the United States in May 1888 for a short summer tour. Buffalo Bill's Wild West returned to Europe in May 1889 as part of the Exposition Universelle in Paris, an event that commemorated the 100th anniversary of the Storming of the Bastille and featured the debut of the Eiffel Tower. The tour moved to the South of France and Barcelona, Spain, then on to Italy. While in Rome, a Wild West delegation was received by Pope Leo XIII. Buffalo Bill was disappointed that the condition of the Colosseum did not allow it to be a venue; however, at Verona, the Wild West did perform in the ancient Roman amphitheater. The tour finished with stops in Austria-Hungary and Germany. In 1891 the show toured cities in Belgium and the Netherlands before returning to Great Britain to close the season. Cody depended on a number of staff to manage arrangements for touring with the large and complex show: in 1891 Major Arizona John Burke was the general manager for the Buffalo Bill Wild West Company; William Laugan (sic), supply agent; George C. Crager, Sioux interpreter, considered leader of relations with the Indians; and John Shangren, a native interpreter. In 1891, Buffalo Bill performed in Karlsruhe, Germany, in the Südstadt Quarter. The inhabitants of Südstadt are nicknamed Indianer (German for "American Indians") to this day, and the most accepted theory says that this is due to Buffalo Bill's show. The show's 1892 tour was confined to Great Britain; it featured another command performance for Queen Victoria. The tour finished with a six-month run in London before leaving Europe for nearly a decade. Buffalo Bill's Wild West returned to Europe in December 1902 with a fourteen-week run in London, capped by a visit from King Edward VII and the future King George V. The Wild West traveled throughout Great Britain in a tour in 1902 and 1903 and a tour in 1904, performing in nearly every city large enough to support it. The 1905 tour began in April with a two-month run in Paris, after which the show traveled around France, performing mostly one-night stands, concluding in December. The final tour, in 1906, began in France on March 4 and quickly moved to Italy for two months. The show then traveled east, performing in Austria, the Balkans, Hungary, Romania, and the Ukraine, before returning west to tour in Poland, Bohemia (later Czech Republic), Germany, and Belgium. The show was enormously successful in Europe, making Cody an international celebrity and an American icon. Mark Twain commented, "It is often said on the other side of the water that none of the exhibitions which we send to England are purely and distinctly American. If you will take the Wild West show over there you can remove that reproach." The Wild West brought an exotic foreign world to life for its European audiences, allowing a last glimpse at the fading American frontier. Surrounded by the Enemy (1865 – December 1887), of the Oglala Lakota band, died of a lung infection. His remains were buried at Brompton Cemetery in London. Red Penny, the one-year-old son of Little Chief and Good Robe, had died four months earlier and was buried in the same cemetery. Paul Eagle Star (1864 – August 24, 1891), of the Brulé Lakota band, died in Sheffield, of tetanus and complications from injuries caused when his horse fell on him, breaking his leg. He was buried in Brompton Cemetery. His remains were exhumed in March 1999 and transported to the Rosebud Indian Reservation, in South Dakota, by his grandchildren Moses and Lucy Eagle Star II. The remains were reburied in the Lakota cemetery in Rosebud two months later. Long Wolf (1833 – June 11, 1892), of the Oglala Lakota band, died of pneumonia and was buried in Brompton Cemetery. His remains were exhumed and transported to South Dakota's Pine Ridge Indian Reservation in September 1997 by his descendants, including his great-grandson, John Black Feather. The remains were reburied at Saint Ann's Cemetery, in Denby. White Star Ghost Dog (1890 – August 17, 1892), of the Oglala Lakota band, died after a horse-riding accident and was buried in Brompton Cemetery. Her remains were exhumed and transported to the Pine Ridge Indian Reservation, in South Dakota, in September 1997, with those of Long Wolf, and were reburied at Saint Ann's Cemetery, in Denby. In 1895, Cody was instrumental in the founding of the town of Cody, the seat of Park County, in northwestern Wyoming. Today the Old Trail Town museum is at the center of the community and commemorates the traditions of Western life. Cody first passed through the region in the 1870s. He was so impressed by the development possibilities from irrigation, rich soil, grand scenery, hunting, and proximity to Yellowstone Park that he returned in the mid-1890s to start a town. Streets in the town were named after his associates: Beck, Alger, Rumsey, Bleistein and Salsbury. The town was incorporated in 1901. In November 1902, Cody opened the Irma Hotel, named after his daughter. He envisioned a growing number of tourists coming to Cody on the recently opened Burlington rail line. He expected that they would proceed up Cody Road, along the north fork of the Shoshone River, to visit Yellowstone Park. To accommodate travelers, Cody completed construction of the Wapiti Inn and Pahaska Tepee in 1905 along Cody Road with the assistance of the artist and rancher Abraham Archibald Anderson. Cody established the TE Ranch, located on the south fork of the Shoshone River about thirty-five miles from Cody. When he acquired the TE property, he stocked it with cattle sent from Nebraska and South Dakota. The new herd carried the TE brand. The late 1890s were relatively prosperous years for the Wild West show, and he bought more land to add to the ranch. He eventually held around 8,000 acres (32 km²) of private land for grazing operations and ran about 1,000 head of cattle. He operated a dude ranch, pack-horse camping trips, and big-game hunting business at and from the TE Ranch. In his spacious ranch house, he entertained notable guests from Europe and America. Cody published his autobiography, The Life and Adventures of Buffalo Bill, in 1879. Another autobiography, The Great West That Was: "Buffalo Bill's" Life Story, was serialized in Hearst's International Magazine from August 1916 to July 1917. and ghostwritten by James J. Montague. It contained a number of errors, in part because it was completed after Cody's death in January 1917. Larry McMurtry, along with historians such as R.L. Wilson, asserted that at the turn of the 20th century, Cody was the most recognizable celebrity on Earth. While Cody's show brought appreciation for the Western and American Indian cultures, he saw the American West change dramatically during his life. Bison herds, which had once numbered in the millions, were threatened with extinction. Railroads crossed the plains, barbed wire and other types of fences divided the land for farmers and ranchers, and the once-threatening Indian tribes were confined to reservations. Wyoming's coal, oil and natural gas were beginning to be exploited toward the end of his life. The Shoshone River was dammed for hydroelectric power and irrigation. In 1897 and 1899 Cody and his associates acquired from the State of Wyoming the right to take water from the Shoshone River to irrigate about 169,000 acres (680 km2) of land in the Big Horn Basin. They began developing a canal to carry water diverted from the river, but their plans did not include a water storage reservoir. Cody and his associates were unable to raise sufficient capital to complete their plan. Early in 1903 they joined with the Wyoming Board of Land Commissioners in urging the federal government to step in and help with irrigation in the valley. The Shoshone Project became one of the first federal water development projects undertaken by the newly formed Reclamation Service, later known as the Bureau of Reclamation. After Reclamation took over the project in 1903, investigating engineers recommended constructing a dam on the Shoshone River in the canyon west of Cody. Construction of the Shoshone Dam started in 1905, a year after the Shoshone Project was authorized. When it was completed in 1910, it was the tallest dam in the world. Almost three decades after its construction, the name of the dam and reservoir was changed to Buffalo Bill Dam by an act of Congress. Cody married Louisa Frederici in 1866, just a few days after his twentieth birthday. The couple met when Cody had traveled to St. Louis under his command during the Civil War. Cody's Autobiography barely mentioned the courtship to Frederici but declared, "I now adored her above any other young lady I had ever seen." Cody suggested in letters and in his autobiography that Frederici had pestered him into marriage, but he was aware that it was "very smart to be engaged." This rhetoric became pushed more and more in his explanations for marriage as the relationship between him and his wife began to decline. Frederici stayed home with their four children in North Platte, while he stayed outside the home, hunting, scouting, and building up his acting career in the Wild West show. As Cody began to travel more frequently and to places farther from home, problems over infidelity, real or imagined, began to arise. These concerns grew so great that in 1893, Frederici showed up at his hotel room in Chicago unannounced and was led to "Mr. and Mrs. Cody's suite." Cody mentions in his autobiography that he was "embarrassed by the throng of beautiful ladies" who surrounded him both in the cast and in the audiences, and this trend continued as he became involved with more and more actresses who were not afraid to show their attraction to him in front of an audience. Cody filed for divorce in 1904, after 38 years of marriage. This decision was made after years of jealous arguments, bad blood between his wife and his sisters, and friction between the children and their father. By 1891, Cody had instructed his brother-in-law to handle Frederici's affairs and property, stating "I often feel sorry for her. She is a strange woman but I don't mind her—remember she is my wife—and let it go at that. If she gets cranky, just laugh at it, she can't help it." Cody hoped to keep the divorce quiet, so as to not disrupt his show or his stage persona, but Frederici had other ideas. Filing for divorce was scandalous in the early 20th century, when marital unions were seen as binding for life. This furthered Cody's determination to get Frederici to agree to a "quiet legal separation," in order to avoid "war and publicity." The court records and depositions that were kept with the court case threatened to ruin Cody's respectability and credibility. His private life had not been open to the public before, and the application for divorce brought unwanted attention to the matter. Not only did townspeople feel the need to take sides in the divorce, but headlines rang out with information about Cody's alleged infidelities or Federici's excesses. Cody's two main allegations against his wife were that she attempted to poison him on multiple occasions (this allegation was later proved false) and that she made living in North Platte "unbearable and intolerable" for Cody and his guests. The press picked up on the story immediately, creating a battle between Cody and Frederici's teams of lawyers, both of which seemed to be the better authority on Nebraska divorce law. Divorce laws varied from state to state in the early 1900s. Desertion was the main grounds for divorce, but in some jurisdictions, such as Kansas, divorce could be granted if a spouse was "intolerable." The Victorian ideal of marriage did not allow for divorce in any case, but the move westward forced a change in the expectations of husbands and wives and the ability to remain married. In Lewis and Clark County, Montana, 1867 records show that there were more divorces in that year than marriages. Part of the appeal of the frontier was that "a man cannot keep his wife here." After Cody's announcement that he was suing for divorce, Frederici began to fight back. She claimed that she had never attempted to poison him and that she wished to remain married. The trial then moved to court in February 1905. One of the witnesses who spoke to a newspaper was Mrs. John Boyer, a housekeeper in the Cody home who was married to a man who worked for the Wild West show. She claimed that Frederici acted inhospitably towards Cody's guests and that, when Cody was not at the ranch, she would "feed the men too much and talk in a violent manner about Cody and his alleged sweethearts ... and that she was seen putting something into his coffee." Other witnesses mentioned Cody's comment that in order to handle his wife he had to "get drunk and stay drunk." The battle in court continued, with testimony from three witnesses, Mary Hoover, George Hoover and M. E. Vroman. After the witnesses had testified, Cody changed his mind about the divorce. Cody's change of mind was not due to any improvement in his relationship with Frederici but rather was due to the death of their daughter, Arta Louise, in 1904 from "organic trouble." With this weighing heavily on him, Cody sent a telegram to Frederici hoping to put aside "personal differences" for the funeral. Frederici was furious and refused any temporary reconciliation. Cody decided to continue pursuing the divorce, adding to his complaint that Frederici would not sign mortgages and that she had subjected him to "extreme cruelty" in blaming him for the death of Arta. When the trial proceeded a year later, in 1905, both their tempers were still hot. The final ruling was that "incompatibility was not grounds for divorce," so that the couple was to stay legally married. The judge and the public sided with Frederici, the judge deciding that her husband's alleged affairs and his sisters' meddling in his marriage had caused his unhappiness, not his wife. Cody returned to Paris to continue with the Wild West show and attempted to maintain a hospitable, but distant, relationship with his wife. 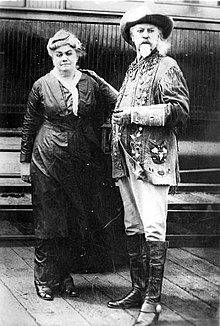 The two reconciled in 1910, after which Frederici often traveled with her husband until his death in 1917. Cody died on January 10, 1917. He was baptized in the Catholic Church the day before his death by Father Christopher Walsh, of the Denver Cathedral. He received a full Masonic funeral. Upon the news of Cody's death, tributes were made by George V, Kaiser Wilhelm II, and President Woodrow Wilson. His funeral service was held at the Elks Lodge Hall in Denver. The governor of Wyoming, John B. Kendrick, a friend of Cody's, led the funeral procession to the cemetery. At the time of his death, Cody's once-great fortune had dwindled to less than $100,000 (approximately $1,956,000 today). He left his burial arrangements to his wife. She said that he had always said he wanted to be buried on Lookout Mountain, which was corroborated by their daughter Irma, Cody's sisters, and family friends. But other family members joined the people of Cody to say he should be buried in the town he founded. On June 3, 1917, Cody was buried on Lookout Mountain, in Golden, Colorado, west of Denver, on the edge of the Rocky Mountains, overlooking the Great Plains. His burial site was selected by his sister Mary Decker. 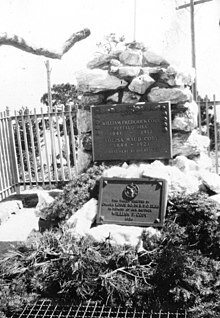 In 1948 the Cody chapter of the American Legion offered a reward for the return of the body, so the Denver chapter mounted a guard over the grave until a deeper shaft could be blasted into the rock. On June 9, 1917, his show was sold to Archer Banker of Salina, Kansas for $105,000 (approximately $2,053,000 today). As a frontier scout, Cody respected Native Americans and supported their civil rights. He employed many Native Americans, as he thought his show offered them good pay with a chance to improve their lives. He described them as "the former foe, present friend, the American" and once said that "every Indian outbreak that I have ever known has resulted from broken promises and broken treaties by the government." Cody supported the rights of women. He said, "What we want to do is give women even more liberty than they have. Let them do any kind of work they see fit, and if they do it as well as men, give them the same pay." In his shows, the Indians were usually depicted attacking stagecoaches and wagon trains and were driven off by cowboys and soldiers. Many family members traveled with the men, and Cody encouraged the wives and children of his Native American performers to set up camp—as they would in their homelands—as part of the show. He wanted the paying public to see the human side of the "fierce warriors" and see that they had families like any others and had their own distinct cultures. Cody was known as a conservationist who spoke out against hide-hunting and advocated the establishment of a hunting season. Cody was active in the concordant bodies of Freemasonry, the fraternal organization, having been initiated in Platte Valley Lodge No. 32, in North Platte, Nebraska, on March 5, 1870. He received his second and third degrees on April 2, 1870, and January 10, 1871, respectively. He became a Knight Templar in 1889 and received his 32nd degree in the Scottish Rite of Freemasonry in 1894. In 1872, Cody was awarded the Medal of Honor for service as a civilian scout to the 3rd Cavalry Regiment, for "gallantry in action" at Loupe Forke, Platte River, Nebraska. In 1917, the U.S. Army—after Congress revised the standards for the award—removed from the rolls 911 medals previously awarded to civilians or for actions that would not warrant a Medal of Honor under the new higher standards. Cody's medal was among those revoked. In 1977, Congress began reviewing numerous cases; it reinstated the medals for Cody and four other civilian scouts on June 12, 1989. Cody was honored by two U.S. postage stamps. One was a 15¢ Great Americans series stamp. The Buffalo Bill Historical Center was founded in Cody, Wyoming - the town is named in his honor. Buffalo Bill's Wild West and the Progressive Image of American Indians is a collaborative project of the Buffalo Bill Historical Center and the history department of the University of Nebraska-Lincoln, with assistance from the Center for Digital Research in the Humanities at the University of Nebraska in Lincoln. This digital history project contains letters, official programs, newspaper reports, posters, and photographs. The project highlights the social and cultural forces that shaped how American Indians were defined, debated, contested, and controlled in this period. This project was based on the Papers of William F. Cody project of the Buffalo Bill Historical Center. The National Museum of American History's Photographic History Collection at the Smithsonian Institution preserves and displays Gertrude Käsebier's photographs of the Wild West shows. Michelle Delaney has published Buffalo Bill's Wild West Warriors: Photographs by Gertrude Käsebier. Some Oglala Lakota people carry on family show business traditions from ancestors who were Carlisle Indian School alumni and worked for Buffalo Bill and other Wild West shows. Several national projects celebrate Wild Westers and Wild Westing. Wild Westers still perform in movies, powwows, pageants and rodeos. The Buffalo Bills, a National Football League team based in Buffalo, New York, were named after the entertainer. Other early football teams (such as the Buffalo Bills of the All-America Football Conference) used the nickname, solely for name recognition, as Cody had no special connection with the city of Buffalo. He did however live for a few years in nearby Rochester. Three of Buffalo Bill's children are buried at Mount Hope Cemetery in Rochester, New York. Euro Disneyland Railroad locomotive #1 is named the W. F. Cody in his honor. 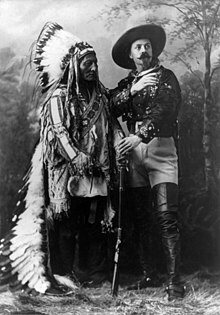 Buffalo Bill has been portrayed in many literary, musical, and theatrical works, movies, and television shows, especially during the 1950s and 1960s, when Westerns were most popular. Some examples are listed below. 1926: With Buffalo Bill on the U. P. Trail is a silent film starring Roy Stewart as Buffalo Bill. 1935: Annie Oakley starring Moroni Olsen as Buffalo Bill. 1936: The Plainsman with James Ellison portraying Cody. 1944: Buffalo Bill, is a film about Cody's life, starring Joel McCrea and Maureen O'Hara. 1950: Annie Get Your Gun, a film version of Broadway musical starring Louis Calhern as Buffalo Bill. 1953: Pony Express, a fictional film about the Pony Express, with Charlton Heston portraying Cody. 1976: Buffalo Bill and the Indians, or Sitting Bull's History Lesson, is a fictional film by Robert Altman that features the Wild West show, with Paul Newman as Cody and Geraldine Chaplin as Annie Oakley. The film is based on the play "Indians", by Arthur Kopit. 1995: Wild Bill, is a film based on legends about "Wild Bill" Hickok, in which Buffalo Bill briefly appears in the play Scouts of the Plains, with Jeff Bridges as Hickok, Keith Carradine as Cody, and Ellen Barkin as Calamity Jane. 1995: Buffalo Girls is a film based on legends about Calamity Jane, with Peter Coyote as Buffalo Bill, Anjelica Huston as Calamity Jane, Reba McEntire as Annie Oakley, and Russell Means as Chief Sitting Bull. 2004: Hidalgo is a film based on the legend of Frank Hopkins, featuring the Wild West show, with J. K. Simmons as Buffalo Bill and Elizabeth Berridge as Annie Oakley. 1907: A Horse's Tale, by Mark Twain, features Buffalo Bill and his horse. 1920: "Buffalo Bill's Defunct" is a poem by E. E. Cummings. In Poetry, edited by J. Hunter, it is entitled "Portrait". 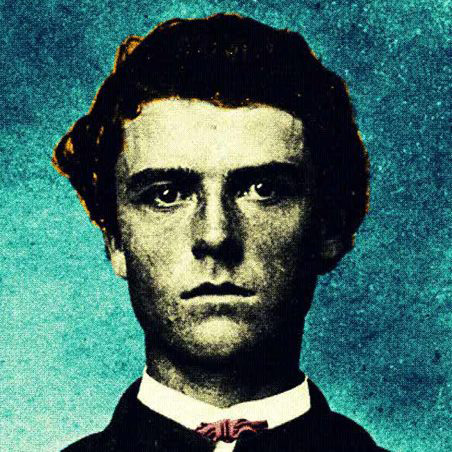 The cover art for the 2011 album Goblin, by Tyler, the Creator, features a picture of Buffalo Bill at the age of 19. Buffalo Bill is a character in the 1946 Broadway musical Annie Get Your Gun, and in the 1968 play Indians, by Arthur Kopit. KAA Ghent, a football club, sports the name in its nickname. Attended a Rangers FC match at Ibrox Stadium in November 1891. Cody was featured as a historical character on such television series about the West as The Life and Legend of Wyatt Earp, Bat Masterson and Bonanza. He has been portrayed as an elder statesman or as a flamboyant, self-serving exhibitionist. Cody was portrayed by Britt Lomond in the episode "A Legend of Buffalo Bill" (1959) of the ABC/Warner Brothers Western television series Colt .45. In The Young Riders, a highly fictionalized story of the Pony Express, Cody was portrayed by Stephen Baldwin. Movies about Cody inspired a youth subculture in the Belgian Congo in the 1950s, with young men and women dressing like him and forming neighborhood gangs. After Congolese independence some of the "Bills" went on to careers in the music industry. ^ "Encyclopedia". The William F. Cody Archive. Retrieved 2018-06-19. Pahaska, also Pe-Ha-Has-Ka and Paha-Haska, as translated from Lakota Sioux language, means "Long Hair," the name given to William F. Cody by the Sioux Nation. ^ a b "Scott County Conservation Department". Scottcountyiowa.com. Archived from the original on July 30, 2013. Retrieved March 3, 2013. ^ Russell, Don. The Lives and Legends of Buffalo Bill. ^ "Historical Plaques of Peel Region". Archived from the original on February 25, 2014. Retrieved February 19, 2014. ^ a b Cody, William F. The Life of Hon. 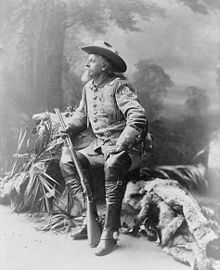 William F. Cody Known as Buffalo Bill, the Famous Hunter, Scout and Guide. A Public Domain Book. ^ a b c Carter, Robert A. (2002). Buffalo Bill Cody: The Man Behind the Legend. Wiley. p. 512. ISBN 978-0-471-07780-0. ^ Buffalo Bill, William Lightfoot Visscher (1917). Buffalo Bill's Own Story of His Life and Deeds: This Autobiography Tells in His Own Graphic Words the Wonderful Story of His Heroic Career. Homewood Press. p. 41. Retrieved 14 May 2017. ^ "No. 619: Holcomb Valley" Archived June 15, 2007, at the Wayback Machine, State Historical Landmarks, San Bernardino County. ^ a b c Cody, William F. (1904). The Adventures of Buffalo Bill Cody. 1st ed. p. viii. New York and London: Harper & Brothers. ^ a b c d e "William "Buffalo Bill" Cody". World Digital Library. 1907. Retrieved June 1, 2013. ^ Warren, Louis S. (2008-04-01). "Was He a Hero?". True West. truewestmagazine.com. Retrieved 11 April 2017. ^ Buffalo Bill (Colonel W.F. Cody) (1920). An Autobiography of Buffalo Bill. pp. 97–104. ^ Buffalo Bill (William F. Cody). "True Tales of the Plains". The William F. Cody Archive. p. Chapters IX and XI. Retrieved 2018-06-19. ^ a b PBS (2001). "William F. Cody". New Perspectives on the West. Retrieved January 23, 2014. ^ Jeff Barnes (2014). The Great Plains Guide to Buffalo Bill: Forts, Fights & Other Sites. Stackpole Books. pp. 46–47. Retrieved 2018-06-19. ^ Duncan, Dayton (2000). Miles from Nowhere: Tales from America's Contemporary Frontier. University of Nebraska Press. ISBN 0-8032-6627-8, 978-0-8032-6627-8. ^ Crossen, Forest (1968). Western Yesterdays, vol. 6, Thomas Fitzpatrick, Railroadman. Paddock Publishing. Fitzpatrick, a lifelong friend of Cody's, met him when he was hired to shoot buffalo to feed the work crew building the Kansas Pacific Railroad. ^ Russell, Don (1982). The Lives and Legends of Buffalo Bill. Norman: University of Oklahoma Press. p. 94. ISBN 9780806115375. Retrieved January 23, 2014. ^ a b c Johnson, Geoffrey. "Flashback: 'Buffalo Bill' Cody wowed Chicago with his 'Wild West' shows". Chicago Tribune. Retrieved 14 May 2017. ^ Streeby, Shelley (2002). American Sensations: Class, Empire, and the Production of Popular Culture ([Online-Ausg.] ed.). Berkeley [u.a. ]: University of California Press. ISBN 978-0520229457. Retrieved August 26, 2015. ^ a b c d e f g h i j Wilson, R.L. (1998). Buffalo Bill's Wild West: An American Legend. Random House. p. 316. ISBN 978-0-375-50106-7. ^ Hall, Roger A. (2001). Performing the American Frontier, 1870–1906. Cambridge University Press. p. 54. ISBN 0-521-79320-3, ISBN 978-0-521-79320-9. ^ Burns, Walter Noble (November 2, 1911). "Frontier Hero - Reminiscences of Wild Bill Hickok by his old Friend Buffalo Bill". The Blackfoot optimist. (Blackfoot, Idaho). Retrieved 14 May 2017. ^ "Buffalo Bill Center of the West"
^ Warren, Louis S. (2003). "Cody's Last Stand: Masculine Anxiety, the Custer Myth, and the Frontier of Domesticity in Buffalo Bill's Wild West". The Western Historical Quarterly, vol, 34, no. 1 (Spring), pp. 55 of 49–69. ^ "No. 1968: Vignettes from the Fair". www.uh.edu. Retrieved 2019-02-10. ^ Isabelle S. Sayers (26 June 2012). Annie Oakley and Buffalo Bill's Wild West. Courier Corporation. p. 76. ISBN 978-0-486-14075-9. ^ Leonard, Teresa (January 9, 2014). "Annie Oakley Injured in NC Train Disaster". News & Observer. ^ Griffen, Four Years in Europe with Buffalo Bill, p. xviii. ^ "William F. Cody Archive: Documenting the Life and Times of Buffalo Bill". ^ Russell, The Lives and Legends of Buffalo Bill, pp. 330–331. ^ Gallop, Buffalo Bill's British Wild West, p. 129. ^ Jonnes, Eiffel's Tower: And the World's Fair Where Buffalo Bill Beguiled Paris, the Artists Quarreled, and Thomas Edison Became a Count. ^ Gallop, Buffalo Bill's British Wild West, p. 157. ^ Russell, The Lives and Legends of Buffalo Bill, p. 352. ^ a b "The Death of 'Eagle Star' in Sheffield", Sheffield & Rotherham Independent, August 26, 1891, at American Tribes Forum, accessed August 26, 2014. ^ Griffen, Four Years in Europe with Buffalo Bill, p. xxi. ^ Russell, The Lives and Legends of Buffalo Bill, p. 439. ^ Moses, Wild West Shows and the Images of American Indians, 1883–1933, p. 189. ^ Kasson, Buffalo Bill's Wild West, p. 88. ^ Russell, The Lives and Legends of Buffalo Bill, p. 321. ^ "The Salford Sioux—Manchester's Own Native American Community (Lancashire) RootsChat.Com". p. 4. ^ "Chief Long Wolf Goes Home, 105 Years Late September 25, 1997". CNN. Archived from the original on April 19, 2010. ^ Kensel, W. Hudson (1987). Pahaska Tepee, Buffalo Bill's Old Hunting Lodge and Hotel, A History, 1901–1946. Buffalo Bill Historical Center. ^ Staten Island on the Web: Famous Staten Islanders. ^ a b Don Russell, The Lives and Legends of Buffalo Bill, 1979. ^ Richard H. Montague, Memory Street, 1962. ^ "Buffalo Bill Dam History". Archived from the original on July 7, 2011. Retrieved March 7, 2011. ^ a b c d e f g h i Kasson, Joy (2000). Buffalo Bill's Wild West: Celebrity, Memory, and Popular History. New York: Hill and Wang. p. 139. ISBN 0-8090-3244-9. ^ W. F. Cody to Al Goodman, Aug. 25, 1891, in Foote, ed., Letters from Buffalo Bill, p. 69. ^ a b c d e f g Warren, Louis (2005). Buffalo Bill's America: William Cody and the Wild West Show. New York: Vintage Books. pp. 490–515. ISBN 0-375-72658-6. ^ Petrik, Paula (1991). "Not a Love Story: Bordeaux v. Bordeaux" (PDF). Montana's Women's History. Montana the Magazine of Western History. ^ a b Haywood, C. Robert (1993). "Unplighted Troths: Causes for Divorce in a Frontier Town Toward the End of the Nineteenth Century". Digital Commons at University of Nebraska. University of Nebraska, Lincoln. ^ a b May, Elaine Tyler (1980). Great Expectations: Marriage and Divorce in Post-Victorian America. Chicago: University of Chicago Press. ^ a b c d "Cody Divorce Case". Erie News, vol. 2, no. 38. February 24, 1905. ^ "MS166.02.07.001 :: MS 166 William F. Cody Divorce Proceedings". ^ Russell, Don (1979). The Lives and Legends of Buffalo Bill. Oklahoma: University of Oklahoma Press. p. 469. ISBN 978-1-4343-4148-8. ^ Weber, Francis J. (1979). America's Catholic Heritage: Some Bicentennial Reflections, 1776–1976. Madison: University of Wisconsin. p. 49. ^ Mosesl, L.G. (1999). The Lives and Legends of Buffalo Bill. Albuquerque: University of New Mexico Press. p. 193. ISBN 978-0-8263-2089-6. 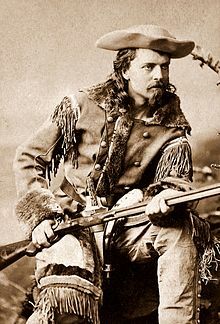 ^ a b "'Buffalo Bill' Cody". A Few Famous Freemasons: American Founders. Grand Lodge of British Columbia and Yukon A.F. & A.M. Retrieved November 23, 2011. ^ "Buffalo Bill Show Sold" (PDF). The New York Times. June 10, 1917. ^ Exhibit, National Cowgirl Museum and Hall of Fame, Fort Worth, Texas. ^ Goppert, Ennest J. "Buffalo Bill Cody". Masonic World. Archived from the original on November 14, 2012. Retrieved May 20, 2012. ^ Polanski, Charles (2006). "The Medal's History". Congressional Medal of Honor Society. Archived from the original on September 28, 2007. ^ Sterner, C. Douglas (1999–2009). "Restoration of 6 Awards Previously Purged From The Roll of Honor". HomeOfHeroes.com. ^ "The Buffalo Bill Project". ^ "Buffalo Bill's Wild West Warriors: Photographs by Gertrude Käsebier - Smithsonian". ^ Richard O. Reisem (1994). Mount Hope, Rochester, New York: America's First Municipal Victorian Cemetery. Landmark Soc. of Western New York. p. 66. ISBN 978-0-9641706-3-6. ^ "Buffalo Bill at the age of 19". Anotha.com. Archived from the original on 2013-11-03. ^ "When Buffalo Bill brought his Wild West show to Scotland". www.scotsman.com. Retrieved 2019-02-23. ^ Page, Thomas (December 8, 2015). "The Kinshasa Cowboys: How Buffalo Bill Started a Subculture in Congo". CNN. Retrieved January 28, 2016. Cody, William F. (1879). The Life of Hon. William F. Cody Known as Buffalo Bill the Famous Hunter, Scout and Guide: An Autobiography. Hartford, Connecticut: Frank E. Bliss. A facsimile edition was published in 1983 by Time-Life Books as part of its 31-volume series Classics of the Old West. Cunningham, Tom F. (2007) .Your Fathers Ghosts: Buffalo Bill's Wild West in Scotland. Edinburgh: Black and White Publishing. ISBN 1-84502-117-7. Gallop, Alan (2001). Buffalo Bill's British Wild West. Stroud: Sutton. ISBN 0-7509-2702-X. Griffin, Charles Eldridge (2010). Four Years in Europe with Buffalo Bill. Lincoln: University of Nebraska Press. ISBN 0-8032-3465-1. Haywood, Robert. (1993). "Unplighted Troths: Causes for Divorce in a Frontier Town Toward the End of the Nineteenth Century." Great Plains Quarterly 1, no. 1. Jonnes, Jill (2010), Eiffel's Tower: And the World's Fair where Buffalo Bill Beguiled Paris, the Artists Quarreled, and Thomas Edison Became a Count. New York: Penguin. ISBN 0-14-311729-7. Kasson, Joy S. (2000). Buffalo Bill's Wild West: Celebrity, Memory, and Popular History. New York: Hill and Wang. ISBN 0-8090-3244-9. May, Elaine Tyler (1980). Great Expectations: Marriage and Divorce in Post-Victorian America. Chicago: University of Chicago Press. Moses, L. G. (1996). Wild West Shows and the Images of American Indians, 1883–1933. Albuquerque: University of New Mexico Press. ISBN 0-8263-2089-9. Petrik, Paula (1991). "Not A Love Story—Bordeaux vs. Bordeaux." Montana, the Magazine of Western History 41, no. 2, 32-46. Rosa, Joseph G.; May, Robin (1989). Buffalo Bill and His Wild West: A Pictorial Biography. Lawrence: University Press of Kansas. ISBN 0-7006-0398-0. Russell, Don (1960). The Lives and Legends of Buffalo Bill. Norman: University of Oklahoma Press. ISBN 0-8061-1537-8. Rydell, Robert W.; Kroes, Rob (2005). Buffalo Bill in Bologna: The Americanization of the World, 1869–1922. Chicago: University of Chicago Press. ISBN 0-226-73242-8. Sell, Henry Blackman; Weybright, Victor (1955). Buffalo Bill and the Wild West. New York: Oxford University Press. Wetmore, Helen Cody (1899). Last of the Great Scouts: The Life Story of Col. William F. Cody (Buffalo Bill), as Told by His Sister Helen Cody Wetmore. Duluth, Minnesota: Duluth Press Printing. Wilson, R. L.; Martin, Greg (1998). Buffalo Bill's Wild West: An American Legend. New York: Random House. ISBN 0-375-50106-1. Buffalo Bill Days (June 22–24, 2007), a 20-page special section of The Sheridan Press, published in June 2007 by Sheridan Newspapers (144 Grinnell Avenue, P.O. Box 2006, Sheridan, Wyoming, 82801, USA). Includes information about Buffalo Bill and the schedule of the annual three-day event held in Sheridan, Wyoming. "Story of the Wild West and Camp-Fire Chats by Buffalo Bill (Hon. W. F. Cody)". A Full and Complete History of the Renowned Pioneer Quartette, Boone, Crockett, Carson and Buffalo Bill. copyright 1888 by HS Smith, published 1889 by Standard Publishing, Philadelphia, Pennsylvania. Cody, William F. (1879). The Life of Hon. William F. Cody, Known as Buffalo Bill, the Famous Hunter, Scout and Guide: An Autobiography. Hartford, Connecticut: F. E. Bliss. Digitized from the Library of Congress. Kasson, Joy S. (2001). Buffalo Bill's Wild West: Celebrity, Memory and Popular History. Hill & Wang. O'Neill, William (1965). "Divorce in the Progressive Era." American Quarterly 17, no. 2, part 1 (Summer), 203–217. Pascoe, Peggy (1990). Relations of Rescue: The Search for Female Moral Authority in the American West, 1874–1939. New York: Oxford University Press. Prescott, Cynthia Culver (2007). "Why She Didn't Marry Him: Love, Power and Marital Choice on the Far Western Frontier". Western Historical Quarterly 38(1), p. 26. Wikimedia Commons has media related to Buffalo Bill. Wikisource has the text of a 1911 Encyclopædia Britannica article about Buffalo Bill. "The Papers of William F. Cody". Archived from the original on November 14, 2013. Retrieved April 30, 2013. "Buffalo Bill Center of the West". Retrieved April 30, 2013. Illinois State University, Milner Library, Special Collections, Circus and Allied Arts Collection. "Buffalo Bill Letters". Retrieved August 13, 2015.